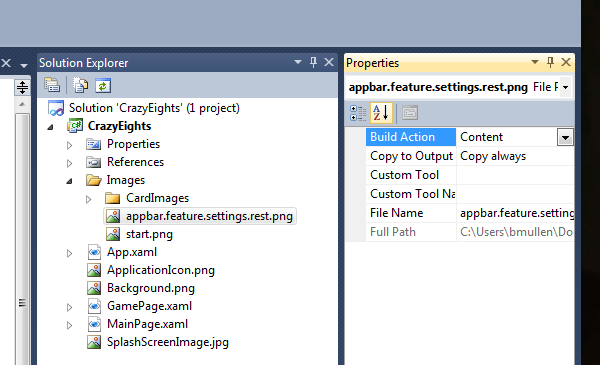 Since the application bar is referencing the image by Uri it can’t seem to find it embedded in the application. your control can be put in that way. the TextBlock that makes up the user control to a panel. Check out the link below. It is a bunch of tutorials on everything you could want to know about Silverlight plus a whole bunch of cool WPF stuff. window relative to the mouse click is a pain. popped up from a control underneath it. primary screen and the application is maximized then your golden. Well, how about using Mouse.GetPosition(Window.GetWindow(this))? That returns the point relative to the window of the control (this). on the primary screen and the application must be maximized. Brian, cut the Brother Stuart and just give us the simple answer! And why am I talking to myself like this? point to convert that point to screen (i.e. desktop) coordinates. you have the application running on.